Dan Absalonson | Author of SciFi & Fantasy: Brian Rathbone's "Call of the Herald" free, then the Audio Book is $1.99! Get your copies now! 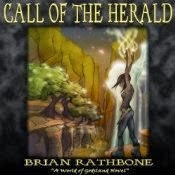 Brian Rathbone's "Call of the Herald" free, then the Audio Book is $1.99! Get your copies now! Word to the wise: If you consume audiobooks like crazy and also like reading eBooks, this is a steal! How cool was it for the author to tell me about the deal too?! Really cool. I hadn't even remembered that I already bought the eBook for Call of the Herald, which holy crap is FREE right now, so I can get this audio book for a steal! So go get the eBook and read it, or better yet - then go get the audio book for $1.99 and you can switch between reading the eBook at home and the audio book while in the car!